FREE BRADLEY MANNING! DROP ALL CHARGES! END THE TORTURE! 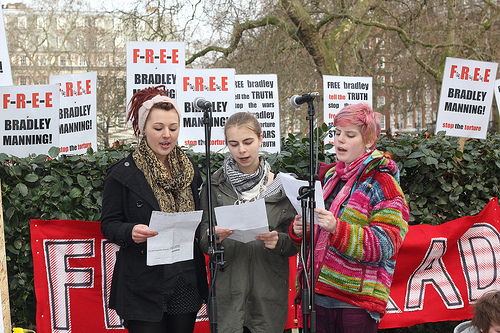 Saturday 20 March 2011 was an International Day of Solidarity for Bradley Manning. Vigils and protests were organised in the US, including at the Quantico base in Virginia where Manning is being held, and around the world. In London, a number of groups came together outside the US Embassy in London to protest Manning’s continued incarceration and torture. 80+ people turned up to show their solidarity with Manning, with speakers and music. The speakers included Bruce Kent, Peter Tatchell, Ben Griffin, Ciaron O’Reilly and young people from Pembrokeshire who were Bradley’s contemporaries at school. Catholic Worker report on the event on indymedia.org.uk, including links to other solidarity events for Bradley Manning held around the world. See also the report of the event on the Bradley Manning Support Network site and at uk friends of bradley manning and another indymedia report. EVENT ANNOUNCEMENT: BRADLEY MANNING SOLIDARITY EVENT AT US EMBASSY, LONDON. Bruce Kent – Long time British Peace Activist and Organiser. SAS Iraq Combat Veteran, Reusenik when he refused a 2nd tour deouncing the war, gagged from speaking of his experiences by the M.O.D./ High Court. *Open Mike for (3 min) statements. Meet and discuss, following speeches, with other activists how we are going to free Bradley Manning and end the war! Techniques finetuned at Long Kesh, Abu Ghraib and Guatanamo have been unleashed on what U.S. authoriteis see as a nonviolent dissident within the U.S. war machine. U.S. anti-war and human rights activists, lawyers, military veterans and the former commander of Quantico are heading down to Quantico this Sunday March 20 to demand justice for Bradley Manning. Others of us around the world will go on Sunday March 20 to U.S. embassies and sites of siginifiance in the U.S. wars on Iraq and Afghanistan and do like wise. Consider joining us or initiating your own activity for Bradley Manning on Sunday March 20. Bradley has been accused of leaking, to WikiLeaks, footage of a U.S. helicopter gunship massacre in Iraq of 2 Reuters journalists, 9 Iraqi civilians and wounding the children in a vehicle that detoured from the “school run” to tend to the wounded and the dead. Those who carried out this massacre hve not been brought to account, the U.S. government wished to “shoot the messenger”. We refuse to accept this. We hope you to do too? Show visible solidarity with Bradley Manning this Sunday March 20. If not with us at the U.S. embassy at 2pm – in your own community, speak out at church, stand in your city centre, demand Justice for Bradley Manning!